A post half marathon ritual has developed over the years, involving lunch at Webster’s fish and chip restaurant in Baildon. The restaurant is the hub of a small local chain of fish and chip shops, and the food is old-fashioned and superb, with some peculiarities that add to the experience. I ordered a jumbo haddock, Jen had plaice, a mistake she makes every year. The kids were gently steered away from some unspeakable processed teddy bear shaped chunks of breaded chicken towards the kid-sized portions of fish and chips. My fish was excellent, a large, good quality fillet of haddock, skinned, as is the tradition around Bradford and coated in a crisp, light batter. The chips matched the fish in quality and quantity. The kids meals were good, the same fish cut into smaller chunks and fried in the same batter. I’d ordered a Coke. I definitely ordered a Coke, but I didn’t get one. I got a glass of some no-name, no-mark generic cola instead, sickly sweet and cloying with an unappetising after taste. There’s a world of difference between a glass of Panda Cola and a glass of Coca-Cola. I also had, or rather left, a bowl of nuclear green mushy peas. I’ve often wondered about chip shop mushy peas. How do they get them that colour? What on earth do they put into them? How is that possible? 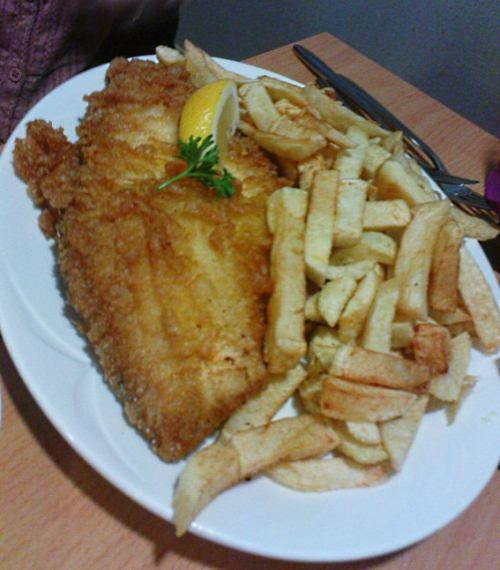 Jen’s plaice looked excellent, but she complained that it was more batter than fish. I struggle to understand how somebody could complain about an abundance of crispy batter, but that’s a different story. The plaice itself was light, delicate and utterly delicious. She ate the fish and left half of the batter. We had a superb meal, let down by some of the extra bits around the edges – odd cola, radioactive mushy peas, too much batter. No actually, strike that last one. There is no need for this. Places like Webster’s should stick to what they do best – serving fish and chips – because they do that extremely well. Webster’s is generally a busy place, but the friendly and the efficient staff had no trouble seating us. A few years ago, I visited with a handful of friends on a dull and wet Wednesday evening. The restaurant was empty. “Can we have a table for six, please?”. A look of mild panic crossed the waitress’ face. We gazed around the barren room, tables laid, chairs empty. It was one of those small moments of absurdity and eccentricity that you always remember, and that makes eating out such a great pastime. Today, just as every time I’ve eaten there, we had a good, old-fashioned meal. Good value, excellent quality fish and chips. A little eccentric. Hugely enjoyable.